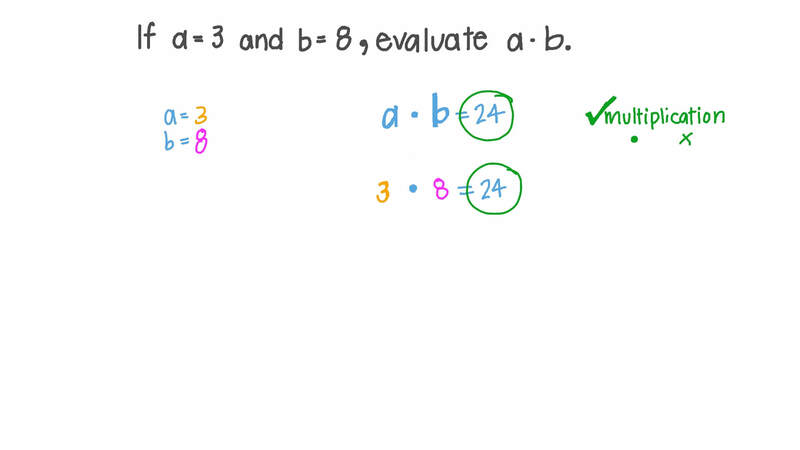 In this lesson, we will learn how to evaluate algebraic expressions at a given value of the variable(s), especially multiplication and division expressions. If 𝑎 = 3 , and 𝑏 = 8 , evaluate 𝑎 ⋅ 𝑏 . Evaluate 1 0 𝑎 ÷ 2 , given that 𝑎 = 4 . Given that 𝑎 = √ 2 and 𝑏 = √ 6 , find the value of 𝑎 𝑏 2 2 . Given that the expression 5 0 0 𝑡 can be used to determine the distance, traveled by a Boeing 707 aircraft, where the variable 𝑡 represents the time in hours , determine the distance the aircraft can travel in 10 hours. Given that 9 𝑥 + 4 𝑦 = 8 and 𝑚 ( 3 6 𝑥 + 1 6 𝑦 ) + 4 𝑛 ( 9 𝑥 + 4 𝑦 ) = 6 4 , what is the value of 𝑚 + 𝑛 ? A pizza delivery company offers 2 medium pizzas and a 1-liter bottle of soda for . They offer 2 sides and a dessert for . Amir ordered 8 medium pizzas, 4 sides, 4 liters of soda, and 2 desserts. What is the cost of his order? Find 𝐴 𝐵 given that 𝐴 = 3 𝑎 + 5 2 and 𝐵 = 2 𝑎 + 6 2 . Given that the multiplicative inverse of 𝑥 − 𝑐 𝑥 − 4 is 𝑥 − 4 𝑥 − 2 , what is the value of 𝑐 ? Fill in the blank: 8 6 𝑥 𝑦 = − 2 𝑥 𝑦 × × 𝑥 𝑦        . If 𝑎 = 3 , and 𝑏 = 9 , evaluate 𝑎 ⋅ 𝑏 . Evaluate 1 8 ÷ 2 𝑎 , given that 𝑎 = 3 . Evaluate 3 0 ÷ 2 𝑎 , given that 𝑎 = 3 . Evaluate 2 4 ÷ 2 𝑎 , given that 𝑎 = 4 . Evaluate 2 4 ÷ 3 𝑎 , given that 𝑎 = 2 . Evaluate 1 8 ÷ 3 𝑎 , given that 𝑎 = 2 . Evaluate 1 6 ÷ 4 𝑎 , given that 𝑎 = 2 . Evaluate 2 4 ÷ 2 𝑎 , given that 𝑎 = 2 . Evaluate 2 0 ÷ 2 𝑎 , given that 𝑎 = 5 .